On behalf of the Olancho Aid Foundation Board of Directors, please accept our gratitude for all the support you provide to our mission through your prayers, donations and solidarity projects. It is my pleasure to share with you the outcomes of our recent annual retreat and planning session. Our 2019 plan can be summarized into the five “F” s.
Through our partnership with the Diocese of Juticalpa, we will continue to expand efforts to increase the spiritual experience of our students, staff and communities we serve. In order to do this, we are aligning our goals with those of the Diocese to provide opportunities for our students to serve the poor, the come together in prayer and to share the good news of the Gospel in the community as they publicly share their Catholic faith. We had a great start this year, through the work of volunteer Karen Wiley who has been working with our students at Instituto Bilinguë Santa Clara. The Board had an opportunity to attend one of the weekly masses at Santa Clara Elementary. We are grateful to Bishop Bonello for assigning Padre Celio to our endeavors. Padre Celio and Sor Alejandra give communion during mass at Santa Clara Elementary School. Board and staff joined this mass alongside students. We were blessed to have volunteer Phil Angell, a builder and an expert in environmentally efficient buildings complete an inventory of all Olancho Aid Foundation facilities and assets. This work will provide us with critical information as we plan for maintenance and repairs, identify and budget for future projects and ensure that our facilities are both safe and support the educational needs of our students. Phil is coordinating with Don Dufault and Richard Mancini, volunteers who, over the last 11 years, have completed over 132 projects with Olancho Aid and continue to train our staff. We have identified several projects and look forward to sharing them with you and integrating the work into that of mission teams. Volunteer Jim Walker, a former CFO, has recently completed a balance sheet audit of the organization and will continue working with Executive Director, Carlos Najera and Controller, Francisco Barahona to implement procedures and controls to ensure that we are not only in compliance with U.S. accounting standards but have documents available for the review by donors and charitable organizations. As the work of the Foundation and the complexity of our endeavors have grown, this effort will allow us to be both efficient in our allocation of funds and to fulfill or fiduciary responsibility to the organization. The Board had an opportunity to meet with parents from all four schools and we listened to their feedback which will be incorporated into our plans for this year. We shared the news with them that our commitment to obtaining U.S. accreditation for our bilingual schools is moving forward. A site visit is scheduled by the New England Association of Schools and Colleges for April 2019. The first step in the process is nearly complete as we are completing an evaluation of current student performance, the scope of the curricula and reviewing standards under the guidance of board member, Jackie Lass. We are excited about our Giving Tuesday campaign that will support installation of collaborative learning spaces that will allow us to supplement the curricula with U.S. programs. Volunteers have recently supported the schools in unique ways; Dani DaCosta has been an asset to the counseling departments at all four schools, Rachael Cina, MSW, has taught a community needs seminar with high school students, and Kat Welling has been tutoring small groups at Santa Clara Elementary while Stephanie Fore teaches sociology at Santa Clara High School. If you are reading this blog, please count yourself as a part of our most valuable asset, our friends and families. 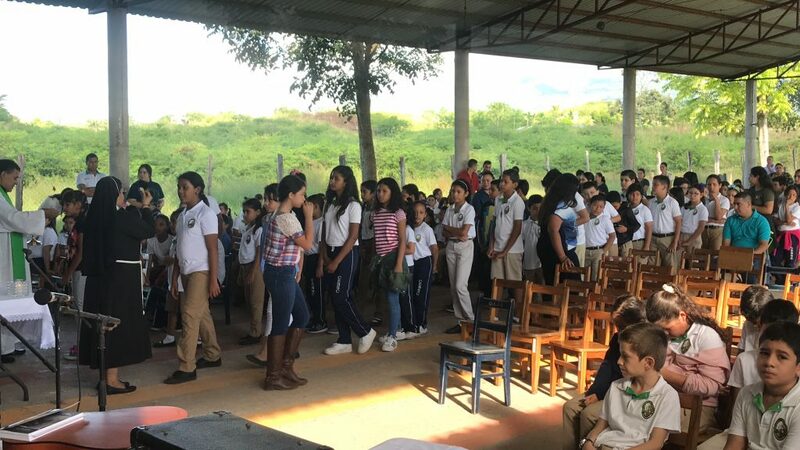 We are grateful to work on behalf of our friends and families who come together from across the U.S. to bring hope, education and transformation to God’s beloved people in Olancho, Honduras. With God’s support we look forward to ensuring that the Foundation continues to flourish for many years to come!